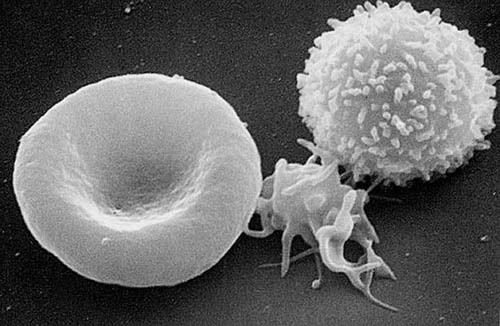 Iron-deficiency anemia (or iron-deficiency anaemia) is a common anemia (low red blood cell or hemoglobin levels) caused by insufficient dietary intake and absorption of iron, and/or iron loss from bleeding which can originate from a range of sources such as the intestinal, uterine or urinary tract. ● The body does not make enough red blood cells. ● Bleeding causes loss of red blood cells more quickly than they can be replaced. The most significant cause of iron-deficiency anemia in developing world children is parasitic worms: hookworms, whipworms, and roundworms. Worms cause intestinal bleeding, which is not always noticeable in faeces, and is especially damaging to growing children. Malaria, hookworms and vitamin A deficiency contribute to anemia during pregnancy in most underdeveloped countries. In women over 50 years old, the most common cause of iron-deficiency anemia is chronic gastrointestinal bleeding from nonparasitic causes, such as gastric ulcers, duodenal ulcers or gastrointestinal cancer. Anemia is one result of advanced-stage iron deficiency. When the body has sufficient iron to meet its needs (functional iron), the remainder is stored for later use in all cells, but mostly in the bone marrow, liver, and spleen. These stores are called ferritin complexes and are part of the human (and other animals) iron metabolism systems. Ferritin complexes in humans carry about 4500 iron atoms and form into 24 protein subunits of two different types.